Your commute on Thursday morning might be a little more exciting than normal, thanks to the St. Louis Cardinals. Fredbird will surprise some lucky MetroBus passengers on Thursday, September 21. 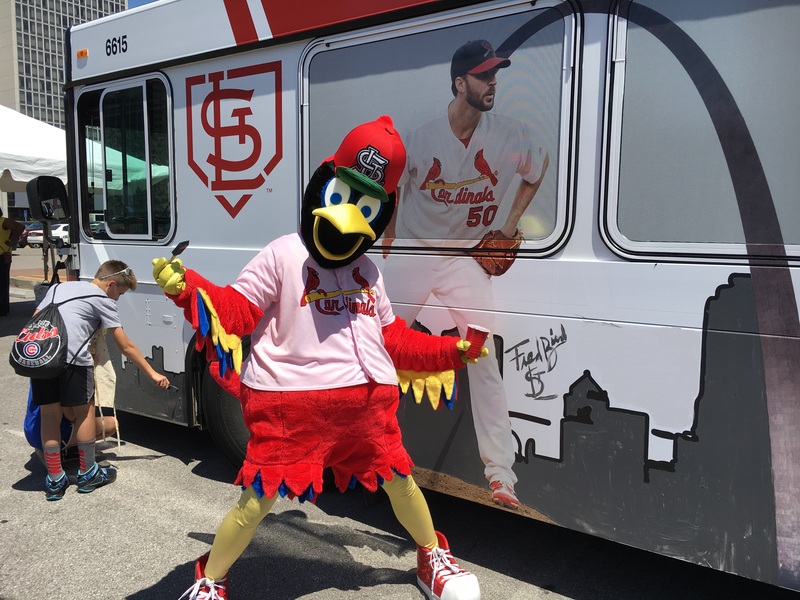 Sometime between 7 a.m. and 8 a.m. on Thursday, Fredbird will hop on the specially painted Cardinals Art Bus somewhere in the St. Louis area — greeting riders as they head to work or school and giving away free tickets to one of the upcoming Chicago Cubs vs. St. Louis Cardinals games at Busch Stadium! Now, we don’t know the MetroBus route or where exactly Fredbird will board. So, be sure to keep an eye out for the Cardinals Art Bus on Thursday, and follow us on Twitter, Facebook and Instagram for more info on his whereabouts. Fredbird will hand out the baseball tickets until they are all gone, so you’re going to have to be at the right place at the right time to snag them. Who knows? It may be your lucky commute! I just watched Fredbird live via Facebook on your bus. Very cool. I was jealous at the end when he gave that lady a kiss. I want a kiss from Fredbird…lol.